It is important for parents and other caregivers to be aware of snow safety for preschoolers to help keep them safe from the dangers of frostbite, hypothermia and weather related accidents. Children love playing in the snow. Building a snowman, sledding and making snow angels are only some of the winter activities that delight youngsters. When they are outside playing, preschoolers seem oblivious to the cold temperatures and wet snow all around them. They usually do not know when to come inside to warm up and are not aware of the potential dangers that exist. It is up to the parents and caretakers of the children to make sure that they remain safe while having fun playing in the snow. The following safety tips will help ensure that preschoolers stay safe while they enjoy the outdoors. Parents should teach their preschoolers how to walk safely on surfaces that are ice covered or slippery. The safest way to walk on slippery surfaces is flat footed and slowly. Lean gently forward with the knees slightly bent and take steps that are short and close together. Before preschoolers go outside in the snow they should eat a snack. Eating a snack gives their body an energy boost from the extra calories. Apply sunscreen to your preschoolers' face, and any other areas of exposed skin, to protect them from sunburn caused by the ultraviolet rays of the run. Snow can reflect the sun's ultraviolet rays up to 85 percent. Just as for adults, several layers of clothing provide children with insulation and ventilation in cold temperatures. In general, a preschooler should wear one extra layer of clothing more than an adult would wear when dressing for the same temperature and weather conditions. A waterproof coat or jacket and pants worn as the top clothing layer stops wetness from melting snow from getting into the other layers of clothing. Keep an extra pair of gloves or mittens in the child's pocket in case the ones they are wearing become wet. Choose clothing made of warm fabrics. A young child or a preschooler should not be allowed to shovel snow. Carrying a shovel full of heavy wet snow can cause muscle strains and sprains. Preschoolers should wear a helmet when they are sledding, ice skating or skiing. Safety goggles for children help protect their eyes from the dangers of the sun and the elements. Young children should not try to use a snowboard. According to the American Academy of Pediatrics, only children over the age of seven should try snowboarding. A child under the age of six should never ride, or be a passenger, on a snowmobile. Areas where children sled should be away from vehicular traffic. There should not be any obstructions, such as trees, fences or large rocks. The area should not be covered in ice. The safest type of sled is a steerable sled. Young children should not sled on inner tubes or snow disks. Make sure the sled is in good working condition and has a well lubricated steering mechanism. It should be structurally sound and free of splinters and sharp edges. Young children should sled in an area separate from older children and adults in areas that are not crowded. The sledding slope should not be steep and should end in a flat safe run. Generally, the sledding slope for preschoolers should not be more than 30 degrees. Preschoolers should wear a well fitted helmet and lower their hat when they are sledding. When sledding children should not lay down on the sled head first. They should either sit up on the sled or lay down feet first. 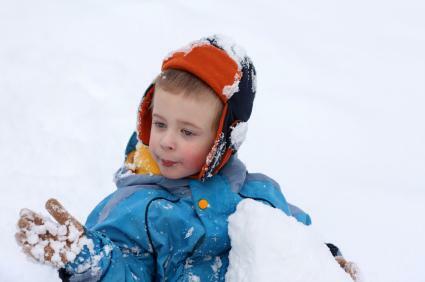 As parents and caregivers, an essential part of snow safety for preschoolers is being aware of the signs of frostbite and hypothermia. For information on frostbite and hyperthermia, including their signs and symptoms, see the article Winter Safety Tips by the American Academy of Pediatrics.